SPF 30 DRY SUNSCREEN IS RECOMMENDED BY THE SKIN CANCER FOUNDATION AS A UVA/UVB SAFE SUNSCREEN!! 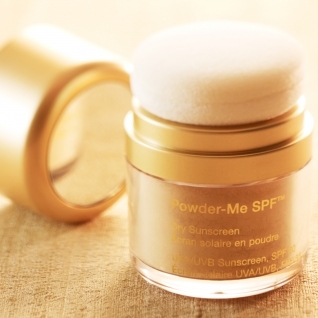 Evelyn is celebrating skin cancer awareness month by offering her clients 20%off Powder-Me SPF 30 Sunscreen! This product comes in 3 shades and is non-greasy and non-chemical. Read more below from Evelyn to find out more about natural mineral sunscreens. Clients are always asking me what I recommend as a safe mineral sunscreen and I have found this to be the best product yet! It’s not sticky and white like traditional liquid mineral sunscreens and it creates a safe reflective barrier on the skin to protect you from the sun’s rays. As I test all of my products extensively, I carried my Powder-Me SPF to a canoe outing last weekend. I applied it all over my body, face, ears, scalp and especially on top of my legs (sitting in a canoe for 1.5hrs in direct sun!!) and I came away with no redness or burning. I tend to burn in about 10min in the sun, so this was quite a feat! Join Evelyn’s Facebook fans and “like” her page for more specials on all SPF products this summer! How many plants are in your current mascara?